Any chemical weapons attack on Syria's last rebel stronghold would lead to "consequences" for the regime in Damascus, French foreign minister Jean-Yves Le Drian warned in Beijing Thursday. 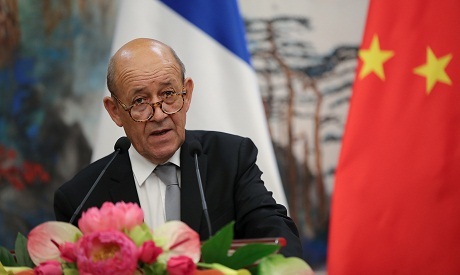 Speaking at a joint press conference with his Chinese counterpart Wang Yi, Le Drian said the use of chemical weapons in the assault would prompt a response from Paris. "France warns against the use of chemical weapons," he said, calling it a "red line". The Assad regime has twice been targeted by US air and missile strikes after previous alleged chemical attacks, and US officials have in recent days said additional action would follow if Assad uses the banned weapons in rebel-held Idlib. The US launched a missile strike on a Syrian air base in April 2017 after an alleged chemical attack in Idlib, while a second US-led strike, supported by the British and French militaries, took place in April this year. Le Drian said any regime chemical attack in Idlib would "have the same consequences as we knew in April". UN chief Antonio Guterres on Wednesday warned Syria and its backers against a full-scale offensive in Idlib, saying it "must not be transformed into a bloodbath". Throughout the seven-year war, which has claimed more than 350,000 lives, Syrian regime forces have repeatedly been accused of targeting rebel-held areas with chemical attacks -- mostly with chlorine but also with deadly sarin nerve gas. The regime and Russia have consistently denied the accusations, blaming opposition fighters instead. But international investigators have found that on at least three occasions the regime unleashed chemical weapons on civilians, while the so-called Islamic State (IS) militant group was also blamed for using mustard gas.